I tried a new chili recipe recently and decided to play around with it a bit. I dehydrated the tomato sauce, kidney beans, added a few seasonings and stored it in my pantry for about a month. When I decided one night to make one of my family’s favorite meals, Chili and Rice, I added four cups of water to the dehydrated chili mixture and was amazed! I think it was one of the best pots of chili I’ve ever made! Give it a try. In a food dehydrator, dehydrate the tomato sauce, kidney beans and chopped onions. To dehydrate the sauce, spread it evenly on two fruit leather trays and dry until it can be easily peeled up and no moisture remains. The dehydration time for these three ingredients varies from dehydrator to dehydrator, but plan on at least six hours. To store, combine the sauce, beans, onion and seasonings in a jar with a tight-fitting lid, a Food Saver bag or even a Zip-Loc bag, depending on how long you wish to store it. The sauce can be rolled up or even torn or cut into small pieces to better fit into the jar. Cooking the dehydrated chili is a dream. Pour the dry ingredients in a large saucepan or pot, along with four cups of water. Cook over medium heat for at least 15-20 minutes or until the beans are completely rehydrated. You can add cooked meat or canned tomatoes at this point, if you wish. As the chili heats, the sauce thickens quite nicely, but you may want to add a bit more water for a thinner consistency. Of course you can cook this in your Sun Oven! Just place the ingredients in a covered pot and set outside in your oven for a couple of hours. 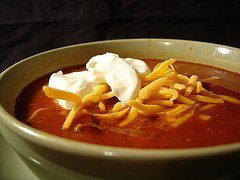 Serve alone, over rice, topped with grated cheddar cheese, saltines, tortilla chips, sour cream, or your own preferred chili toppings. *As long as you’re dehydrating this amount of onion, you might as well dehydrate a whole lot more. Chop enough onion to fill the rest of your dehydrating trays, and you’ll be a step ahead the next time you need chopped onion.